Product Overview Control is the name of the game with the ergonomic MM830 gaming mouse. Top-of-the-line, 24,000 DPI sensor to meet and beat any gaming situation, while a hidden D-pad gives fast access to your most vital abilities and skills in-game. 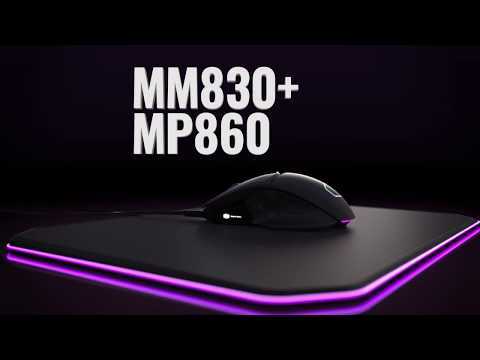 Durable PBT material to reduce wear and tear, RGB illumination to flash your personality, and customizable OLED to display settings or flaunt your colours, the MM830 is the weapon of choice for those who want to carry their team to victory. Keep your most vital abilities close, thanks to D-pad buttons integrated into the thumb rest. The concept behind this design allows you to keep a firm grip with your thumb while rocking up, down, forward and back to actuate the buttons. Map your crucial gear, upgrades, ults, or abilities to any of the D-pad buttons and wipe out the competition with ease. Ensure your arsenal is always within reach but never in the way. The MM830 is outfitted with a top-of-the-line Optical Pixart sensor that can track as high as 24,000 DPI. That means no lag, no stutter, and no fighting with your mouse in the thick of it. And in case you need to favour pinpoint precision over speed, the DPI is instantly adjustable, giving you the ability to make real-time adjustments. Set your default DPI, and four separate DPI settings in 100 DPI increments, anywhere from 100 DPI up to 24,000 DPI. An on-board DPI switch allows you to make on-the-fly adjustments in precision, allowing you to optimize your APM as quickly as you can switch up your macros. The MM830 is outfitted with customizable 4-zone LED lighting capable of full 16.7 million RGB illumination -but wait, there’s more, the back hexagon logo even contains 6 individual RGB LEDs! But there is even more! We’ve incorporated a customizable 96x24 OLED display directly onto the MM830 to add even more personal flair. Flaunt your colours, rep your clan emblems, or fly your fire team banners with pride -or even display crucial stats in the thick of battle. Set a new standard for durability in gaming mice with top cover and left and right click buttons composed of high quality PBT Plastic for maximum protection against wear and tear, while the buttons are equipped with Omron switches for unparalleled longevity. Even the scroll wheel is buffed, with a Japanese ALPS encoder for maximum accuracy and minimal jamming or stickiness for years to come! Features • Hidden D-Pad: Always within reach and out of the way, unleash your ults or vital abilities with four hidden buttons in the thumb-rest area for unmatched fast access. • Precision Wheel: Adjust all your settings from one wheel -and across all Cooler Master devices. • RGB Illumination: Give your victories some flashy good looks with 4-zone RGB illumination. • Quality Construction: PBT chassis minimizes wear and tear due to sweat, sun, and Cheetodust. Omron switches and Japanese ALPS scroll encoder for nice snappy weapon switches. • 24K Sensor: Bigger and better with top-of-the-line sensor and adjustable to 24,000 DPI for any and all battle situations. • OLED Display: Flaunt your colours, rep your clan, or keep track of your APMs, DPI settings, or anything you can imagine with a customizable 96x64 OLED screen right on the mouse.